I just read a blog post which talked about 21st century skills for teachers and students. One of the aspects mentioned was the importance of community involvement. I had the opportunity to interview Debbie Laurie, a teacher in Port Cartier who has lived this for 30 years by getting involved and involving her students in the Terry Fox Run. 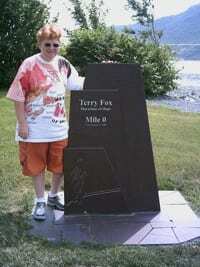 Why did you get involved in the Terry Fox Run? My dad died of lung cancer at the age of 43 in March 1976. When I turned on the news on April 12, 1980, and watched a young amputee dip his leg in the waters of St. John’s Harbour before undertaking a marathon to run across Canada to raise money for cancer research, I knew right then that I was witnessing something that was special. I followed his progress all summer and when, on September 1st, I heard that lung cancer had forced him to abandon his run, I cried along with millions of Canadians and knew that, if needed, I would do my part to help him succeed. How have you involved your students? Every year our school has participated in the Terry Fox Community Run held on the third Sunday of September. Since 2005, we have joined forces with the two French elementary schools in Port-Cartier, and we all walk together on National School Run Day held at the end of September during school hours. I also read Eric Walters’ novel RUN with my class at the start of the school year (learn more about the book here). He has combined Terry’s story with that of a fictional troubled teen, and the kids learn all about the Marathon of Hope and Terry Fox in a well-written book! What do you think it has done for your students? I hope it has made them realize that anything is possible if you dare to dream and have the courage and perseverance to pursue that dream. I believe it has also helped sensitize them to what cancer patients go through and how important ongoing medical research is. It’s all about educating and passing the message on to future generations. How do the parents feel about yours and your students’ participation? They support me and have since the beginning. Many came out to walk in the community runs, and some even come out to walk with us on National School Run Day. They help their kids get sponsors as well, often at their workplace. Many of the French kids in the town call me Madame Terry Fox. You have been doing this for many years, have any of your graduates kept involved? Every year when September rolls around, I begin to mobilize my resources. Facebook has helped me connect with so many, and some have written to tell me they will never forget that first run we did in 1980, and how proud they are to have been part of it. Some participate in their own area…quite a few are kind enough to sponsor me…usually online. One student comes to work annually at the Terry Fox Centre in Ottawa for a week in February. Why do you continue to participate? Why do you feel it is important for students to get involved in causes? As global citizens, they must realize that we must all work together for the common good. There is not one of them whose family has not been touched by cancer. They can also relate to the fact that he was Canadian, young, athletic, and determined. I want them to have a dream and reach for it with all they have. I also want them to realize that they are not alone in this world and that they are part of a global community. As such, they have responsibilities towards their fellow human beings on this journey we call life. I would like to add that because of my ongoing involvement with the Terry Fox Run, I was selected by Coca-Cola to carry the Olympic Torch in the Torch Relay for the Vancouver 2010 Winter Games. On November 10, 2009, in Sept-Iles, QC, I became a part of Olympic history, and it was the greatest night of my life!! 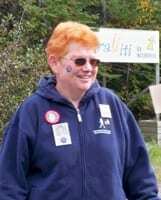 Debbie’s involvement in the Terry Fox Run has impacted on her students. Have you involved your students in fundraising for causes? How has that affected your students? How have you integrated this activity into your teaching? Do you have students who have initiated these efforts? Share your stories. Debbie is an inspiration in more ways than one. There aren’t enough of us who dream big AND who do something about making those dreams come true. But when you meet a person like that, it’s always inspiring. Go Debbie, Go! It”s people like Debbie who, because of their involevemnet and dedication, make it a better world for all of us. Just came back from a local Youth Group meeting tonight and witnessed first hand how somebody like Debbie inspires young people. Our Debbie here in Shawville is John Petty…a teaching colleague and friend, who has been coordinating the community Terry Fox Run in this area for 30 years! The kids were anxious to help or participate this coming Sunday when John quietly extended the invitation. We had just been brainstorming possibilities for community service projects that we’d like to take on for the year when the Terry Fox Run came up. It was a great way to not only kick start the conversation but teach the kids about making a positive difference in the world through action.